In this article, we will touch basis on ways to effectively serve a corporation In California. First, you must personally serve the court documents on the corporation. There are three main ways to effect service of process on a California corporation: 1.) The court summons and complaint can be served to the designated agent, and/or authorized corporate officer for service of process; 2.) The court summons and complaint may be sent through certified mail to the corporation, or 3.) The court summons and complaint may be served by substituted service of process through the California Secretary of State’s office. Read below on how to effectively render service of process on a corporation. To the corporation’s president, chief executive officer, or a person authorized by the corporation to receive service of process. You can find out the name of the corporation’s agent for service on the California Secretary of State website. You may utilize the traditional means of service upon the corporation’s registered agent. A summons may be served by mail as provided in this section. A copy of the summons and of the complaint shall be mailed by first-class mail or airmail to the person to be served, together with two copies of the notice and acknowledgment provided for in subdivision (b) and a return envelope, postage prepaid, addressed to the sender. The court issues an order which states that service can be made upon the corporation by hand delivering the summons and the complaint to the Secretary of State’s office in Sacramento as a substituted service of process upon the corporation. 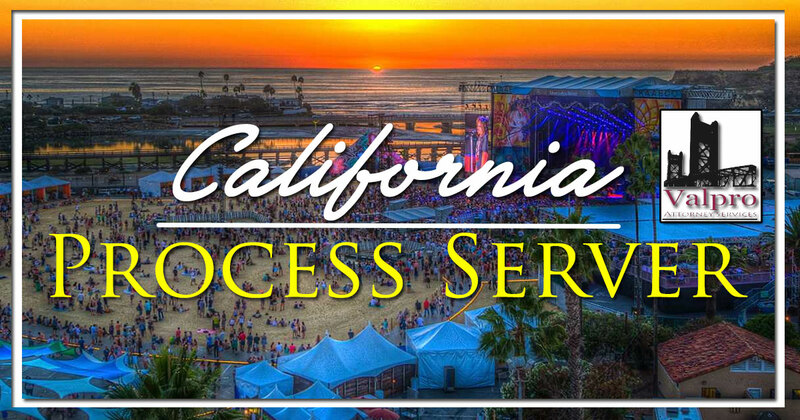 The above documents and fee must be hand-delivered to the public counter at the California Secretary States office located in Sacramento in order to effectively render substituted service of process. Valpro Attorney Service is located in Sacramento and all our process servers are Registered, Bonded and knowledgeable with all forms of service. Feel free to contact us with any questions.